The Fern Lodge is a luxury Adirondack resort featuring rustic and elegant guest rooms, wonderful amenities, and a magnificent setting on Friends Lake. When it came time to modernize their website, they partnered with Mannix Marketing for a professionally designed, SEO friendly lodging website. This resort website puts visitors inside an Adirondack style dwelling with large, impressive photos. 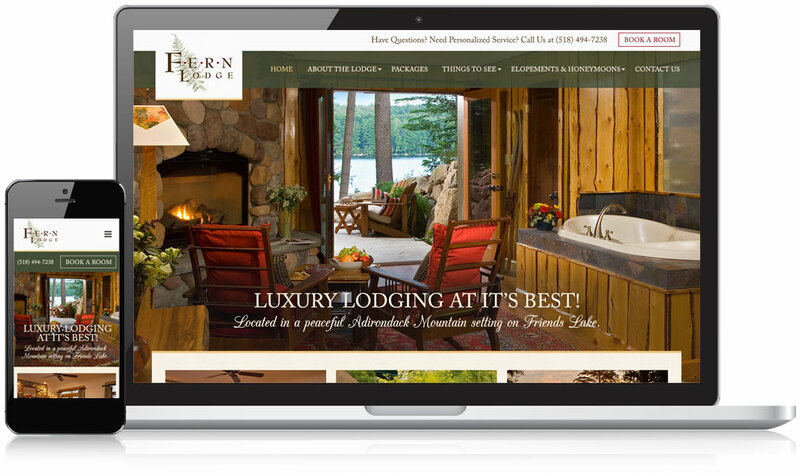 The design shows how the Fern Lodge provides guests with all they could want and more: a rustic, woodsy getaway to the gorgeous Adirondack Park including luxurious rooms and an endless list of activities. After the new website when live, combined with SEO services, we were able to improve organic search traffic by 64% year over year. By improving the site to encourage direct bookings, we were able to improve conversions and occupancy. Mannix Marketing is our only go-to for all our advertising, website development, seo, and social media consult needs. They are the Adirondack business specialists for sure; professional, knowledgeable, skillful, and responsive.